Discussion in 'Amps and Cabs' started by Eskimo_Joe, Apr 28, 2016. That's easy - a Metroplex with one of these mamma jammas! This bundle of joy just arrived and believe the hype, it's legit! I went out on a limb and bought this thing hoping it was worthwhile and what it does for my amp absolutely slays. Ilduce, Polvo, RussB and 2 others like this. Link, info, price, effect, feedback, satisfaction level? Doesn't the MetroPlex already have the Variac option on the PT? Yes, it does. I'm not an expert in the science behind it, but my layman's explanation is that the Brown Box is like the Cadillac version of a variac. Lots more options, which allow you to dial it in even more. My understanding of it is that it doesn't allow you to ramp the voltage beyond what's coming from the wall, so it's sort of a safety net. The Variac setting on the MetroPlex is second tap off the secondary winding which gives you the same B+ voltage as if you were feeding the primary side 90VAC. I guess the Brown Box is useful if you don't want to jump straight to 90 from 120, but kinda redundant if that's where you want to be. Somebody smarter than I am can explain the science of why it sounds so good, but the basic idea is that this thing allows you to adjust the level of voltage that your amp runs on. From what I gather, tube amp components were originally designed to run on 117, whereas modern electricity puts out more like 121, sometimes more. I'm not very familiar at all with the variac function and how it works. That said, I've found it to be relatively subtle at the moderate volume level I typically play at. It makes it sound more like VH for sure. (If only my chops were up to the task ). The Brown Box is a lot more noticeable to my ear. Would like to learn more...please elaborate. Hopefully somebody else can chime in as well as I can only give you my subjective experience, but my wall outlet was putting out between 120-123 (it constantly fluctuates, which is why people apply power conditioners I think). When I cranked the Brown Box down to the setting seen in the picture above, the amp seemed to get warmer, rounder and even more dynamic. The tone is phenomenal to begin with. With the Brown Box, the tone got greasier, sleezier, raunchier - spectacular rawk/blues tone. I love the tech people are coming out with these days to work with amps. Want to run a 100w amp at speaking level and add an effects loop? Here's a Power Station! 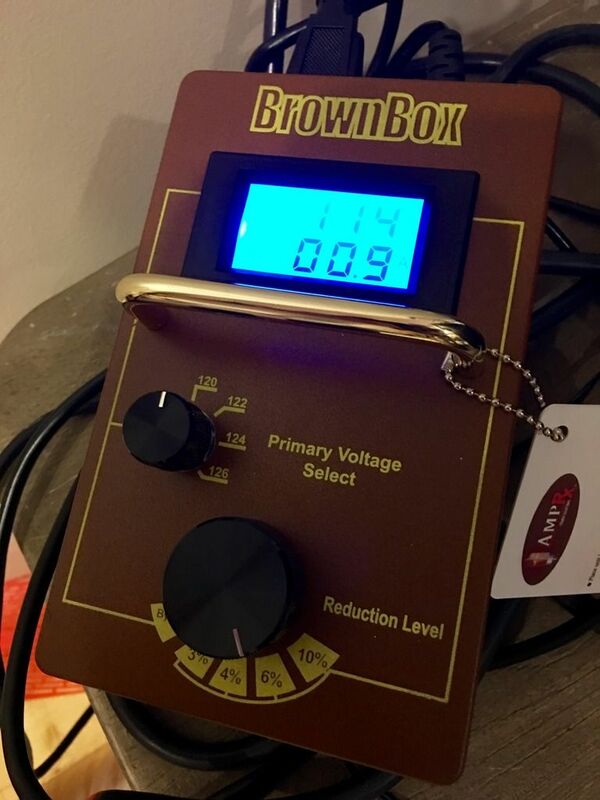 Want to reduce voltage and get the brown sound? Here's the Amprx Brown Box! Now, I just need a stereo effects loop on the PS. foxyguitars, Hacksaw, Teleman76 and 1 other person like this. This really is a 'golden age' of gear. Ilduce, mrwhipple, ReddyKilowatt and 1 other person like this. Awesome form factor.......was eyeballing these awhile back but opted for a much cheaper voltage regulator, but it is quite a bit larger. Mainly what the BB does is take the voltage down to Vintage Levels, that many old amps/tubes were made to run. It softens the sound of the amp, and is not as Hard sounding. Some may like the higher voltage sound, but its mainly to protect the old amps and transformers for high voltages, do it reliably, and use high quality noise free transformers. I initially bought a Parts Express Variac. 10 Amps and about 20- 30lbs. I burned up NOS GEC KT66s because my home wall voltage was consistently over 126v. Sometimes 129v. So instead of buying more pedals, guitars, or anything else, I slowly bought a Voltage Regulator, a Power Conditioner, that is made for High Voltage Devices, and then the BB to lower the volts down to 108v - 112v. The BB also has better components than most Variacs, and adds less potential Noise and EMI. BB also has a Lifetime Warranty. If you have a modern amp, that is designed to run on modern voltage, and lower the volts to much, it may also cause reduced tube life. Can't possibly imagine my Metroplex being any "better" than it is. Thanks for the GAS though Joe! mrwhipple, PurpleJesus and Eskimo_Joe like this. it says on the fly voltage selectability - but wouldnt that require rebiasing of the amp tubes (ie arent they biased at a set voltage). i dont know how they do it, but i thought amps that have built in variacs (like the metroplex or suhr sl68) somehow address this tube biasing dynamic. anyone know how this product safely does this same thing? Hopefully an expert can speak to this, but just from reading up on voltage regulators and misc stories, the voltage coming out of any given wall power outlet can vary between 114 to 130 (based on what I've read, not any scientific report so take it with a grain of salt). This contributes to that inexplicable experience of your rig sounding different/off at some venues and great at other venues. Rebiasing would be a better option. But considering you are lowering the power going though the tubes it isn't a big deal.